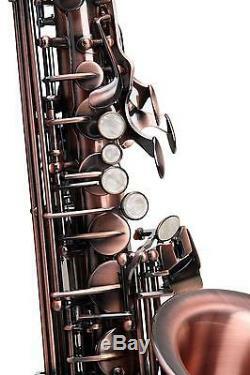 Classic Cantabile Winds AS-450 Antique Red Alto Saxophone. 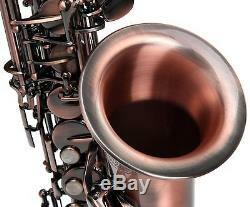 Alto Saxophone made of brass, antique red vintage lacquer, high-F# key. Full, warm sound, very ergonomical key mechanisms, quick response. Good intonation, metal resonators, keys with mother of pearl look. Beautiful engraved logo on bell. The very light, quick response and depth and richness of tone, make this an ideal choice for newcomers and intermediate players, looking to sharpen their skills. This instrument makes playing fun! 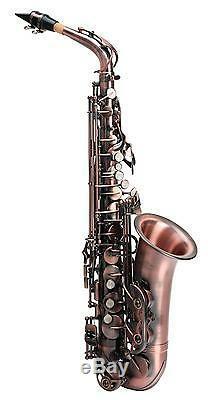 Even the look of the Classic Cantabile Brass AS-450 Alto Saxophone is a lot to offer! The instrument consists of high-quality brass and is completely plated with an antique red lacquer. The key mechanisms have an elegant pearl finish, and the bell is finely engraved. And the extensive range of accessories leaves nothing to be desired: The rugged lightweight case with storage compartments provides strong protection for your instrument and is practical to wear as a backpack and keep your instrument and accessories securely where they need to be! 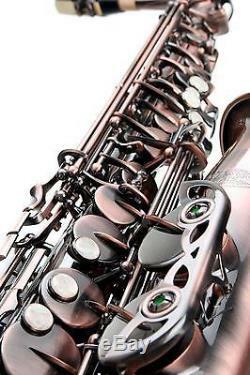 A supplied cleaning rod ensures a clean interior and can easily be stored and transported in the saxophone. The neck and a mouthpiece with ligature are included, so you can get started right away! Additionally, a cleaning cloth and a pair of gloves are included. Counseling by musicians for musicians. Own brands at an unbeatable price through direct import. » Digital Pianos & Keyboards. » PA & Sound Equipment. » Guitars, Bass & Strings. Artikelnummer: 00037396 / Versandklasse: 30 / Item 55461 / Type: 9 / Site:3 / Template: 600. The item "ALTO SAXOPHONE BRASS WIND INSTRUMENT SAX RED SET CASE MOUTHPIECE CLEANING ROD" is in sale since Thursday, December 22, 2016. 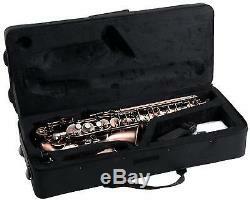 This item is in the category "Musical Instruments\Wind & Woodwind\Band & Orchestral\Saxophones".